FEFU scientists are developing a methodology to calculate the ratio of dust and gas in comas and tails of comets. This will reveal more about the history of the solar system and its development, as well as to understand the processes that took part on different stages of universal evolution. A team of scientists from the Far Eastern Federal University (FEFU) under the supervision of the astrophysicist Evgenij Zubko, Ph.D., a lead scientist of the School of Natural Sciences at FEFU, is trying to solve a fundamental problem of modern astrophysics—to assess the reflectivity of cosmic dust particles and their ability to scatter star light. To do so, the scientists study the optic characteristics of dust particles in the comae and tails of comets. The methodology under development is based on the Umov effect—an inverse correlation between the reflectivity of a body and the degree of linear polarization of light scattered by it. The brighter an object, the lower its polarization. This relation was first formulated by the Russian physicist Nikolay Umov in 1905. According to Evgenij Zubko, the Umov effect was previously studied only for surfaces, such as the lunar regolith and the surfaces of asteroids. The explanation of this effect, given in 1960s and 1970s, excluded its application to the individual dust particles that comprise the regolith. However, the team concluded that the Umov effect is almost equally applicable to individual particles and surfaces in general. Previously, the researchers concluded that the Umov effect holds in a homogenous sparse cloud of space dust. In the article published in the July 11, 2018 print issue of Monthly Notices of the Royal Astronomical Society, the scientists suggested that this physical effect could be also applicable to clouds characteristic of comae and tails of comets consisting of two types of dust particles. The Umov effect is also expected to be observed in three-component clouds of cosmic dust that are typical for protoplanetary disks. By studying the degree of linear polarization acquired by sunlight when it is scattered by cometary dust particles, scientists can give a reliable estimation of the particles' albedo or reflectivity. This characteristic is an extremely important for retrieving the total volume of dust expelled from a comet. The latter parameter allows the scientists to improve the existing methods of estimation of the dust-to-gas volume ratio in cometary comae. This is one of the most important characteristics of cometary evolution—for example, it could indicate the place in the solar system in which the comet was formed. "Knowing the ratio between the volumes of ejected dust and gas, we can better understand the evolutionary stages passed by different comets and the circumstances of the solar system formation. 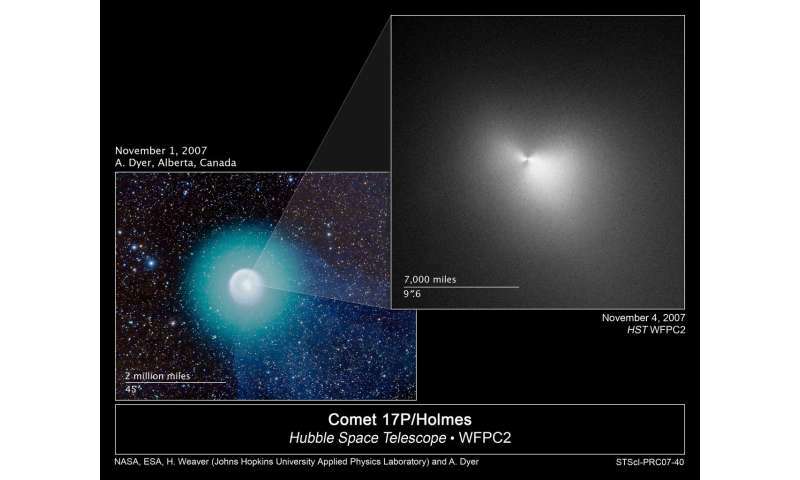 However, while it is easy to calculate the volume of gas in a comet, in the case of dust particles, this is much more complicated," said Evgenij Zubko. "When we measure the sunlight reflected by the coma, we need to understand the number of dust particles that contribute to light scattering. Their albedo or reflectivity is the key data we require to answer this question. However, different dust particles also behave differently, and the difference in the reflectivity of dark and bright particles in comets may exceed 10 times. This is a common issue nowadays, which also arises in other areas of astrophysics, such as the evaluation of matter volumes in protoplanetary disks around other stars. We strive to understand the value of this albedo and use additional methods to do so—in particular, polarimetry to measure the degree of linear polarization and, thus retrieve the reflectivity of cometary dust particles based on the Umov effect." There is still a lot to be discovered in the course of this work. "We are literally chasing a ghost," says the scientist. He also pointed out that to achieve a breakthrough in this area of studies required collaboration among groups of astrophysicists from different parts of the world. The analysis methodology based on the Umov effect may also serve as a key to understanding the processes of formation and evolution of other planetary systems, and therefore the solar system, as well. According to Evgenij Zubko, the value of the Umov effect for science in general is as high as the importance of the spectral analysis method developed by Gustav Kirchhoff. While spectral analysis reveals the chemical compositions of distant bodies based on the light reflected from them, the Umov effect can reveal their size.